This book is so graphic and searing, it will forever change the way you view elephants in captivity. 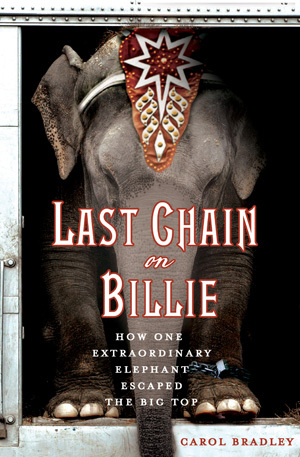 Carol Bradley, an award-winning journalist who has written extensively about animals and animal rights, tells the story of Billie, an elephant captured in Asia and brought to America to perform in circuses. How Billie survived and was saved from a life of abuse is an inspiring true story of resilience and hope. 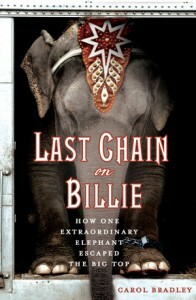 Instead of spending her life surrounded by family and free to wander the jungles of Asia, Billie was captured, fenced in, had all four legs shackled and likely was beaten into submission. Captured elephants also routinely are starved and sometimes kept awake for several days — anything to break the animal’s spirit. The isolation, the food deprivation, the cruelty are all used to make creatures such as Billie “trainable.” She arrived in the United States in 1966 at age 4, a purchase of the small Southwick’s zoo in Mendon, Massachusetts. Experts now know that severing the mother-baby attachments of certain animals too soon — especially sensitive creatures such as elephants — can cause incalculable psychological damage. This is what happened to Billie, and why most of her life she was labeled as a problem elephant. Traveling in trucks, chained and barely able to move, and performing surrounded by harsh lights and blaring music was Billie’s nightmarish life. The chains eventually were removed when she became part of the largest elephant rescue in American history. Billie now lives out her life in Tennessee, free to roam through open meadows at a sanctuary for performing elephants and with the comfort of being part of a herd. This remarkable book is difficult and, yes, painful to read, but necessary if we hope to improve the lot of performing animals in this country.